Attention, all Disney Fans! Do you enjoy learning about the Disney theme parks? Perhaps you're enamored with the man who was Walt Disney? Maybe you're just plain crazy for Mickey Mouse and the Disney big-screen features? No need to order your serving of Disney history and knowledge a la carte anymore. 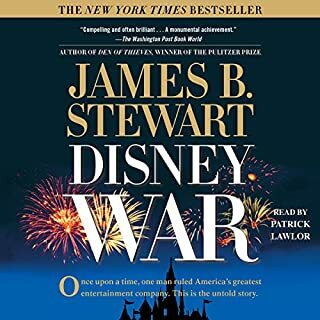 DisneyWar is an enthralling tale of one of America's most powerful media and entertainment companies, the people who control it, and those trying to overthrow them. It tells a story that - in its sudden twists, vivid, larger-than-life characters, and thrilling climax - might itself have been the subject of a Disney classic - except that it's all true. Really interesting story... No ending. Universal Studios never really wanted to get into the theme park business. They wanted to be the anti-Disney. But when forced to do so, they did it in a big way. Despite the fits and starts of multiple owners, the parks have finally gained the momentum to mount a serious challenge to the Walt Disney Company. How did this happen? Who made it happen? What does this mean for the theme park industry? We've all read about the experts: the artists, the scientists, the engineers - that special group of people known as Imagineers for The Walt Disney Company. But who are they? How did they join the team? What is it like to spend a day in their shoes? More like a collection of emails. How to Be Like is a "character biography" series: biographies that also draw out important lessons from the life of their subjects. In this new book - by far the most exhaustive in the series - Pat Williams tackles one of the most influential people in recent history. 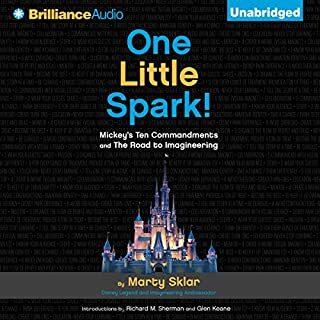 While many recent biographies of Walt Disney have reveled in the negative, this audiobook takes an honest but positive look at the man behind the myth. For the first time, the book pulls together all the various strands of Disney's life into one straightforward, easy-to-listen-to tale. One of the best books I've heard yet! Almost everything you know about Mickey Mouse is wrong: He wasn’t Disney’s first star; Steamboat Willie wasn’t his first movie; Mickey wasn’t a nice guy - and Walt Disney didn’t invent him. In 1928, two very different best friends invented Mickey Mouse. And the success tore them apart. Walt Disney and Ub Iwerks’ friendship is a story of betrayal, love, war, money, power, tragedy, intrigue, humor, despair, and hope. You’ll love them both - when you don’t want to drop anvils on their heads. And they all lived happily ever after... Not quite. What is it like to be the eyes and ears of the institution known as "The Happiest Place on Earth"? How does it really feel to work day in and day out leading part of the world-famous Disneyland Custodial Team? Just how do they keep such a busy place so clean? Find the answers to these questions and more as secrets are revealed in this unauthorized, honest, and affectionate memoir from insiders who struggled to keep guests happy, tame wild new cast members, and keep the original Disneyland clean through a time of tremendous change. From the Progress City Archives comes this collection of tall tales and true from the annals of the Walt Disney Company. From Walt's on-set antics to the creations of modern-day imagineers, we've put together a sampling of stories from throughout Disney history. In The Wisdom of Walt, Professor Jeffrey Barnes distills Walt Disney's vision, his knowledge, and his methods into a series of actionable lessons. Through historical vignettes about Disneyland, as well as plentiful examples and exercises, Barnes creates a framework through which you can apply Walt's wisdom to improve your career, your company, and your life. Welcome, foolish mortals, to Disney Press' spookiest chapter book series yet: Tales from the Haunted Mansion! Based on the attractions from the Disney Parks, each book tells the terrifying tales of some of the Haunted Mansion's 999 ghosts. The Pixar Touch is a lively chronicle of Pixar Animation Studios' history and evolution, and the "fraternity of geeks" who shaped it. With the help of visionary businessman Steve Jobs and animating genius John Lasseter, Pixar has become the gold standard of animated filmmaking, beginning with a short special effects shot made at Lucasfilm in 1982 all the way up through the landmark films Toy Story, Finding Nemo, Wall-E, and others. While the success of Disneyland is largely credited to Walt and Roy Disney, there was a third, mostly forgotten dynamo instrumental to the development of the park: fast-talking Texan C. V. Wood. Three Years in Wonderland presents the never-before-told, full story of "the happiest place on earth". The secret for creating magic in our careers, our organizations, and our lives is simple: outstanding leadership, the kind that inspires employees, delights customers, and achieves extraordinary business results. No one knows more about this kind of leadership than Lee Cockerell, the man who ran Walt Disney World Resort operations for over a decade. On May 25, 1977, a problem-plagued, budget-straining, independent science-fiction film opened in a mere 32 American movie theatres. Conceived, written, and directed by a little-known filmmaker named George Lucas, Star Wars reinvented the cinematic landscape, ushering in a new way for movies to be made, marketed, and merchandised. Simply put, George Lucas is one of the most influential filmmakers of the past 50 years. The Disneyland Story: The Unofficial Guide to the Evolution of Walt Disney's Dream is the story of how Walt Disney's greatest creation was conceived, nurtured, and how it grew into a source of joy and inspiration for generations of visitors. Despite his successors' battles with the whims of history and their own doubts and egos, Walt's vision maintained momentum, thrived, and taught future generations how to do it Walt Disney's way. ©2014 Sam Gennawey (P)2014 Audible Inc. The narration is killing me. 2 1/2 hours in but doubt I can finish with this narration. I have over 800 downloads this is in the bottom 5 narrations for me. 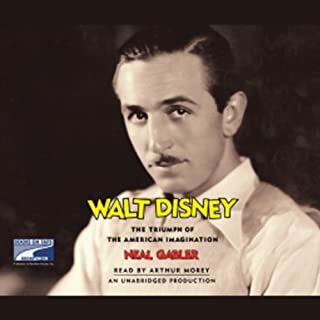 If you want a great book on Disney go with "Walt Disney the Triumph of the American Imagination" great book, great narration that gives you much more than Disneyland and intimately brings Walt's story to you. I listened to the unabridged version. 33 hrs. and actually listened twice with many books marks on things we can learn from one most extraordinary people there has ever been. My parents moved to pre-freeway and pre-Disney Anaheim when I was two-years old. As I approached six years old I remember sleeping with my window open, smelling orange blossoms and hearing the Mark Twain whistle from a few miles away. In short, I enjoyed this book very much. In fact, I listened to it twice, back-to-back. However, I believe my enthusiasm was because this was a page from my life. I remember going to Disneyland many times, meeting Walt sitting at the end of main street, no crowds and enjoying all the park as it evolved. Even my Grad Night (Anaheim High School) was held at this venue. I'm not sure if non-Disney fans will enjoy the book as much as I did. However, I can attest to the fact that it is an excellent narrative on the evolution of the Magic Kingdom. Before reading this book, I read the reviews and almost moved on. There were many complaints about the reader or the production quality in regards to pausing. Let me tell you how I felt regarding this issue. First: this book is very good. It offers a detailed and fascinating view of the inception and construction of Disneyland from its concept to the present. Second: the reader does a fine job and is not distracting or difficult to understand. However, there are some minor production issues regarding proper spacing in time between sections in the book. The reader simply moves from one section to the next without much indication. Where you would expect a beat or a pause, the reader just keeps going. I don’t attribute this to the reader though, but to the production. That said, it’s not very distracting once you realize it’s happening. The whole book is chronological (for the most part) so it flows well. I highly recommend this book if you are interested in the subject matter. Be aware of this “pausing” issue and you will enjoy the listen. Really gets deep into the creation of Disneyland, especially the early years. Through the further it got in time from the beginning of Disneyland, the more it turned into high level highlights. That may be due to the material available. I really enjoyed the book overall, addicting even. I can't wait to go back to Disneyland and see it a whole new light thanks to this book. Don't they have editors for the narration? What did you like best about The Disneyland Story? What did you like least? For the Disneyland aficionado--casual or manic--this is a wonderful book. Provides just enough of Walt's background to help the park make sense, explains what makes it unique, and helps us understand the story behind each ride, with just enough ride description to allow the Disneyland fan to close the eyes and get dreamy. 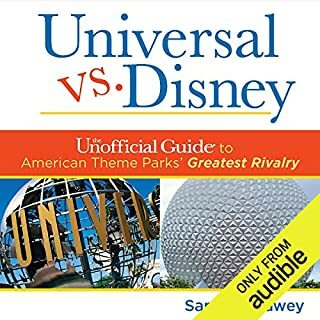 What other book might you compare The Disneyland Story to and why? It is journalistic in style--just the facts. The narrative voice is clear and relatively unemotional. It is history with very little commentary. The performance almost ruins the book. The worst part--this derives from the way the book is put together--is that the narrator does not provide enough "white space" (audible pauses) between sections. The book is written in chapters, but the chapters are very long and are divided into multiple sections with headings. The narrator hurtles from one section to the next as though just reading the next sentence in a paragraph. This results in repeated "WTF" moments for the listener. Just a slight pause between sections would serve as a transition. Although I know this is unlikely, the narrator makes it sound as though he was paid to get through the book as fast as possible, or as if he did not enjoy the job. With another narrator! Actually there are quite a few movies and archival documentaries on this topic. Please re-do this book. I would listen again to another narrator! I am so glad I listened to this book. It was Amazing!!! Yes, the reader jumps from chapter to chapter quickly but you can get used to it. 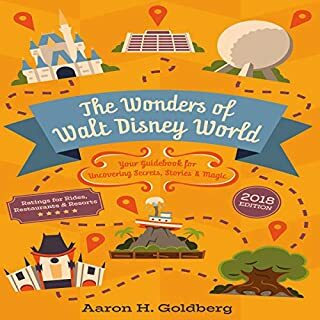 If you love Disney and it’s history you must listen to this book. I loved hearing about the background of each attraction. I’m certain I’ll go back to it again and again!! Never has a book of nonfiction about something so seemingly mundane as a theme park made me come so close to tears. Disneyland is not just a place, but a dream brought to life. The remarkable dream of a truly remarkable man. I love the amazing details behind the scenes of building the Disneyland parks I never knew. And I have every book about Walt and Disneyland and this is a great detailed book! Having raised two of our kids for years in Southern California, Disneyland was a hallmark of their childhoods. I've always been a fan, and sometimes wondered what it took to bring this giant vision to life. 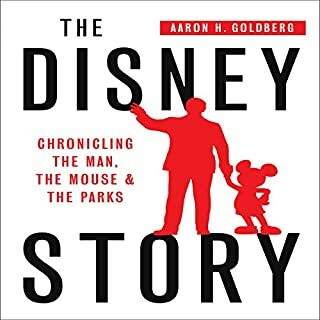 The author takes you through so many of the major and minor stories filling the decades-long evolution that started with Walt and the went beyond his death. You'll hear stories about the original concept, about tireless lobbying with Anaheim city officials to secure the land AND to expand the infrastructure around the park (in a world where nothing like his ever existed before), about rides that did and didn't work, the shocking amount of times that existing rides today have been made over over the last few decades, the lack of attention Disneyland suffered as the company focused on emerging parks in Florida and around the world, the differences between the Walt vs the Eisner years, and much more (including ill-fated plans involving Long Beach and Queen Mary). The main message? No matter who was at the helm, Disneyland has always been about making something better through revision over time. You'll see countless examples of how, to Walt's original vision, this park was never "done" but was always being reinvented and "plussed" to keep bringing the crowds back as they raised their own entertainment bar higher and higher. Even rides like the Tiki Room, with the audio-animatronic birds that started the who AA movement within Disney, has had countless years to be tweaked, tuned, and improved. The one complaint I've seen about this audio version is the narrator. I will agree that he isn't great, but certainly not enough to ruin a very good tale. If you've ever been curious about how this iconic park redefined theme parks and set a new standard for others that would come after its founding in 1955, then you should definitely check this out. Enjoy! I loved the content of this book and would consider it a must read for any Disneyland junkie like myself. While the narrator did a good job overall I was taken aback by the repeated mispronunciations of several Disney legend imagineers. As I didn't read the book the mistakes may have been made by the author, and if that is the case I apologize to the narrator. However, given the extensive research that must have gone into this book I highly doubt it was the author's error. Overall though fantastic book and I would highly recommend it to anyone! What made the experience of listening to The Disneyland Story the most enjoyable? I like Disney, always have and I think I always will. This book provides a thorough history of the California parks and it's very well produced. This is an interesting look at a great entertainment icon. From its humble beginnings to looking forward to tomorrow. 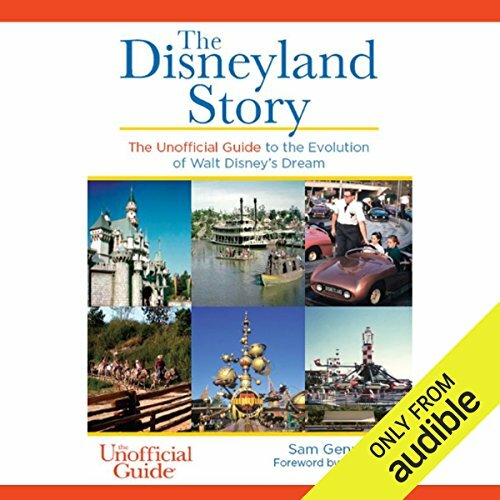 A great listening experience for anyone who has been or is planning to visit Disneyland for the first time.